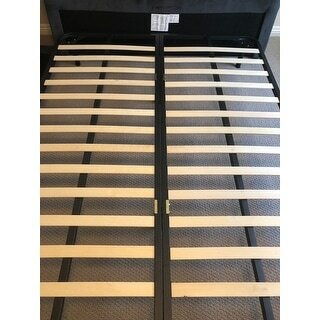 After ordering this bed I was notified the delivery date of 6/13 part of it arrived 6/17, I checked with the freight company they did receive the Entire Bed but was sending it to yet another freight company to deliver. The NEW freight company showed up with two of the three boxes. I received Bed rails and slats...NO BED. Neither of the two freight companies could find the third box that they just received the previous day. Upon calling OS they told me I had to weight three days, then when I requested replacement...I finally called after 5 days with NO word from anyone and they still had no answers if and when I would get a new bed. This was ordered Memorial day and now they tell me it would be delivered by Labor Day!! I demanded a full immediate refund...this was theft in my opinion. WORST SERVICE EVER- Back to *** I will go NEVER AGAIN Epic fail for OverStock. We stayed in a Vrbo that had this bed and I loved it so much I reached out to the owner to find out where they bought it! Was so excited to get it even faster than promised. It was pretty easy to put together but be aware that the letters are mismarked on some of the parts. Take the time to be intuitive about it and it will work! Thank you to the other reviewer who said something about it so when I ran into the problem I didn’t miss a beat. Love love love this bed, feels high quality, sturdy and soft and absolutely beautiful. 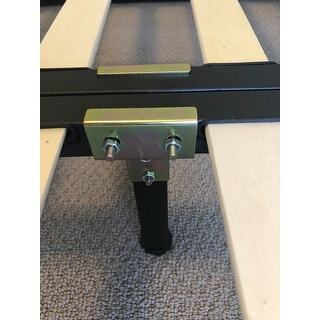 Attached picture of the part in question and how it should go, as well as our new 14” memory foam mattress (also from overstock) so you can see how high it sits without a box spring. This bed was easy to put together. It took about 45 mins to assemble. I love the high quality of the bed. This bed is beautiful and crafted very well. The color and texture are just as represented in photos. The assembly instructions are composed of 3 photos - no words and mine were mislabeled. I figured it out eventually :) If you are having it shipped - splurge on the delivery to the bedroom option. I did not and I had to lug the huge headboard upstairs. Shipping also takes about 3-4 weeks from order to receiving it, which is what the site says, but heads up. All in all a great buy and I would recoomend. The velvet bed looks beautiful. I am so happy with this purchase. Would recommend. Creative marketing by maker... "You clearly have great taste". Oversized shipping takes a little longer and is delivered through local warehouse delivery service. Setup instructions have several errors so read the pamphlet thoroughly, separate your screws and bolts and use your best deductive reasoning to figure out the correct instructions - it's fairly simple. This bed is beautiful and well constructed with quality materials. The fabric color is exactly as it appears in the photo. It is a little lower profile than we expected so we are getting used to how low we sleep to the ground now but not a big deal. I highly recommend this product. It is velvet so I recommend using a fabric protector to make clean up easy in case dirty clothes or animals unintentionally rub up against it. LOVE this bed! Great value and beautiful velvet make this bed a real statement piece in any bedroom. Delivery was quick. The box was ripped upon delivery but no damage done to the contents. Would highly recommend. Great-looking, well-made piece. Get it. This is another well-made, heavy quality piece. Construction was relatively easy and the bed is solid. The fabric is high-quality and looks like the photos. Excellent - such a rich grey color - really very impressive when you walk in the room! Absolutely love it!! Looks like something you would see in an upscale hotel! Very nice. Velvet feels amazing! I loved the look of the bed, but the directions are horrible and the side rails still don't fit together. "Can you use a low profile boxspring?" "I love the velvet look, is it available in other colors other than grey"
This is the only color available. "Is it possible to get a fabric sample of this before ordering?" Yes, we have swatches available. You can give us a call or email the request in. "What is the distance between the top of the slats and the floor?" "When will this bed become available in King size?" "Do you have this bed frame available in King Size? As of 12/20/16 it shows there is only 7 Queen available. Will you get king back in stock?" 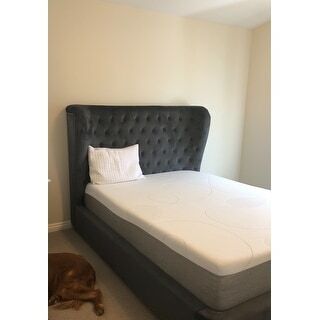 "What ate the dimensions of headboard height in particular"
Queen: 69 x 88 King: 85 x 88 Headboard: 56 All measurements have been rounded off and are approximate.